You are here: Home / Uncategorized / How to Eat Seasonally (Even if You’re an Urban Dweller) – Printable Recipes! 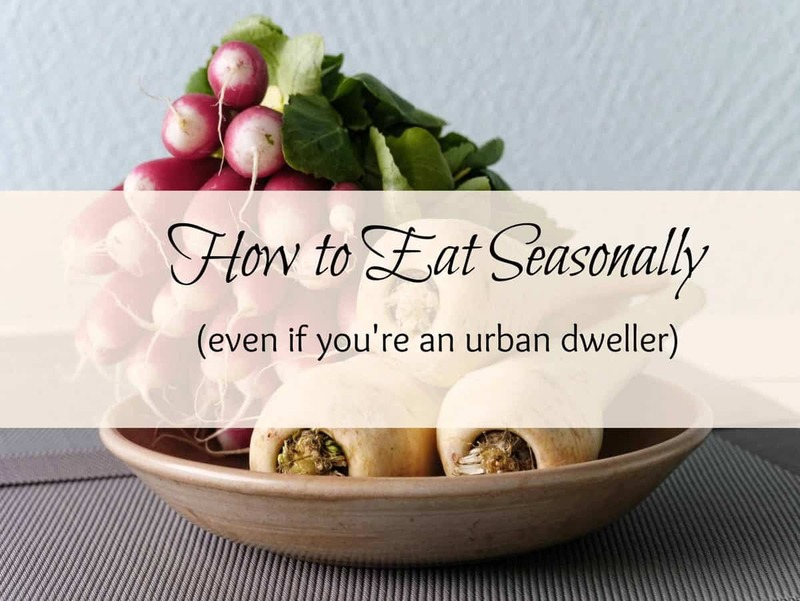 How to Eat Seasonally (Even if You’re an Urban Dweller) – Printable Recipes! Part of being sustainable and living naturally is making the commitment to eat seasonally. Eating seasonally didn’t come naturally to me – it’s been a process of taking small steps. When I started growing my own food, a natural pull to eat what I’ve grown emerged. I spent all that time and effort growing it, and I wanted to see a result for all that effort. I’ve started growing my lettuce, arugula (even though I’m not too fond of it), radishes, beets, cauliflower, and much more. Starting to eat seasonally is sometimes difficult – there’s some items you will give up for the time being, but it’s a frugal and healthy way to live. The key to eating seasonally isn’t to just eat what’s in season, it’s also to enjoy it by using flavor, adding nutrients, and finding a new way to use well-known vegetables. I started eating based on the season by replacing my regular food items (that were out of season) with foods that were in season. It’s a simple method, but effective. With your homegrown lettuce, you can make a salad, but if carrots aren’t harvestable yet in your garden, you can replace the carrots with shredded radishes or sliced beets. Replace potatoes with cauliflower for mashed cauliflower with garlic and green onions. Cauliflower is an early spring, low-carb substitute that’s packed with more nutrients than potatoes. You can find a recipe at the end of this article. With a little creativity, you will create new dishes, and find new ways to eat overlooked foods. 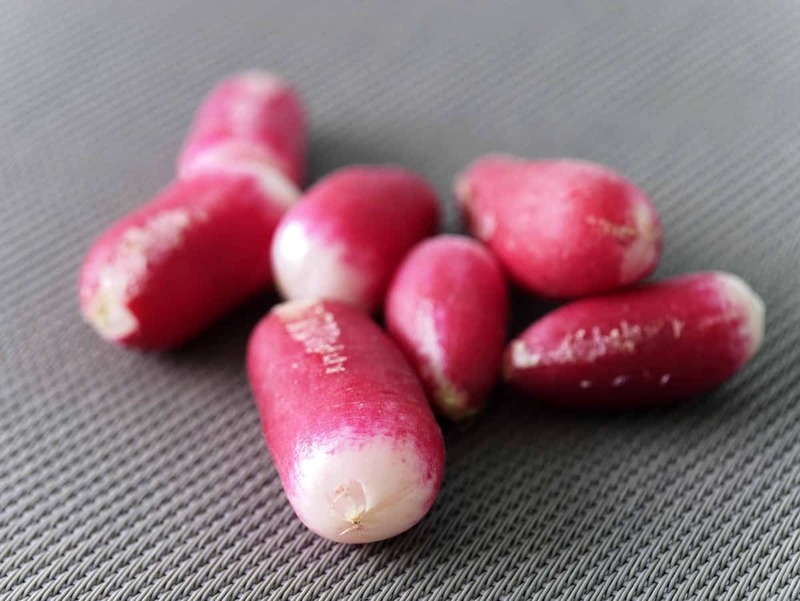 Tired of radishes? That happens to me too. 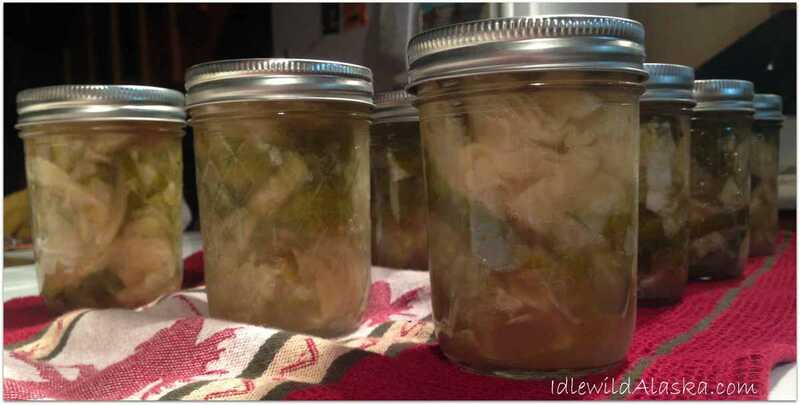 One solution is to ferment your in-season vegetables for a different texture or taste. 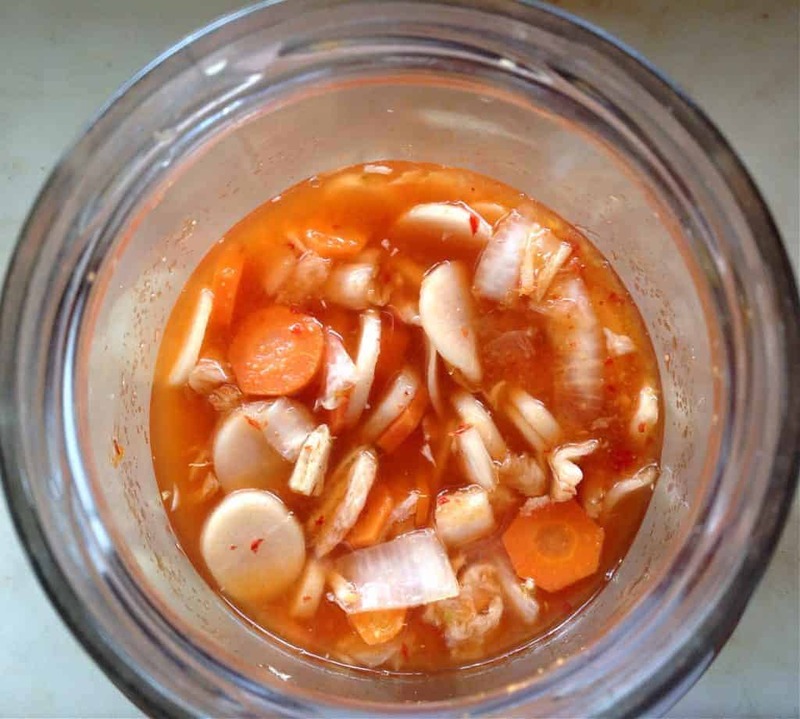 When you ferment vegetables, you unlock beneficial probiotics, enzymes, and nutrients. Vegetables just got a whole lot more interesting. When you ferment something, besides unlocking all those natural goodies, you also add a different taste to your pallet. You can ferment in brine, add whey, or ferment different vegetables and fruits together for different tastes. It’s a different world than raw or cooked veggies. To eat seasonally with ferments this spring, you can try your hand at sauerkraut, which uses cabbage, and Kimchi, which is a Korean dish of fermented vegetables. How to Make Kimchi from Grow Forage Cook Ferment (If peppers aren’t in season yet in your area, you can leave them out). Eating seasonally isn’t limited to vegetables, or what you can grow in your backyard. Eating seasonally encompasses all of the goodies that are available during that season. In spring, there’s, for example, eggs, wheat grass, and milk products. Now is the season when chickens come out of their winter break, and start laying again. 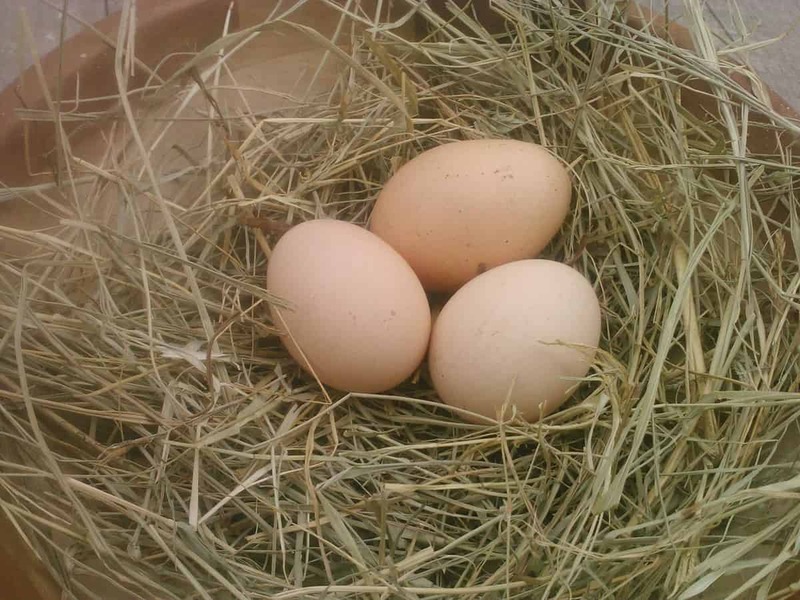 If your chickens have started laying (or if you have access to farm-fresh eggs), add eggs to your meal to up the protein value. My husband loves to add hard boiled eggs to all his salads. It’s one way to get him to actually eat a salad! You can mix lettuce, beets, and eggs with your favorite dressing for a simple but flavorful salad. Winter wheat grass is also coming in season. In my area, it’s grown for its seeds, but it’s valuable as a spring crop as well. If you don’t have ready access to it, you can buy organic wheat seed marketed specifically to sprout, and grow some in a sunny window in your home. Wheat grass is a great source of protein! You can add it to smoothies by blending it with your other ingredients, or dehydrate it, then blend it to make a powder. Another alternative to eat seasonally is to sprout wheat seed, then dehydrate it and grind it into a flour. You can use it just like regular flour. It’s much more nutritious than regular flour because you unlock a lot of vitamins when you sprout it. It’s also the start of calving season. If you’re lucky enough to have a cow, or have access to cow’s milk, you also have access to whey. While you can use whey in your ferments, you can also add it to smoothies or meals for an extra nutrient and protein boost. This is not necessarily the same whey that is sold in natural food stores. Real whey is a by-product when you make cheese or yogurt. You can use it in place of water in recipes, add it to mashed cauliflower, make pancakes with it, or use it as a substitute for buttermilk in salad dressings. For example, if you’re making a stir fry, add whey when you start cooking. The vegetables and meat (if you’re using it) will be infused with some of the whey’s nutritional properties. Making cheese is something of a lost art that’s making a comeback. It’s super easy, and a great way to eat seasonally (and it’s also a great way to get whey, as I discussed above). You can add homemade mozzarella to a sandwich of arugula and marinated beets, or use ricotta in a spinach salad to add flavor. Adding a homemade mozzarella to your salad, or ricotta to dinner is a great way to liven up seasonal vegetables to eat seasonally. Have a lot of homegrown veggies to use up? Want to try something new? Did you know you can use vegetables to make dough? You probably know about potatoes, but what about cauliflower? You can make pizza dough from caulifower for as nutrient-packed, low carb option. A better known option is to trade out taco shells for large lettuce leaves when eating tacos. The lettuce leaves are a healthier option, but still full of flavor. You can substitute couscous with ground cauliflower in Moroccan dishes and tabbouleh for an easy but flavorful way to eat seasonally. One way to eat seasonally without getting tired of your produce is to use marinades and roast your vegetables. I create marinades by combining my oil of choice (usually olive oil) with vinegar, and add herbs or spices in whatever flavor I feel like that day. I’m a big fan of curries, so I marinade in different curries I’ve invented, or if I feel like adding Italian flavors, I might add oregano or thyme. For example, since beets are in season in early spring, you can marinade your beets in an Italian-inspired marinade, and grill or roast them. Or, consider marinating turnips, then mashing them! You can also add marinated seasonal vegetables to a sandwich or salad for a different taste and texture. Since arugula can be a little bitter, if you include it in a sandwich with vegetables marinated with a sweeter flavor, it will counteract that bitterness, and you’ll still get the benefits of nutrient-packed arugula. These are just very general ideas to help you eat seasonally, but you get the picture. Dress up your vegetables with a little flavor for a new way to eat them! Great tips and thanks for sharing the recipe. I love cauliflower. 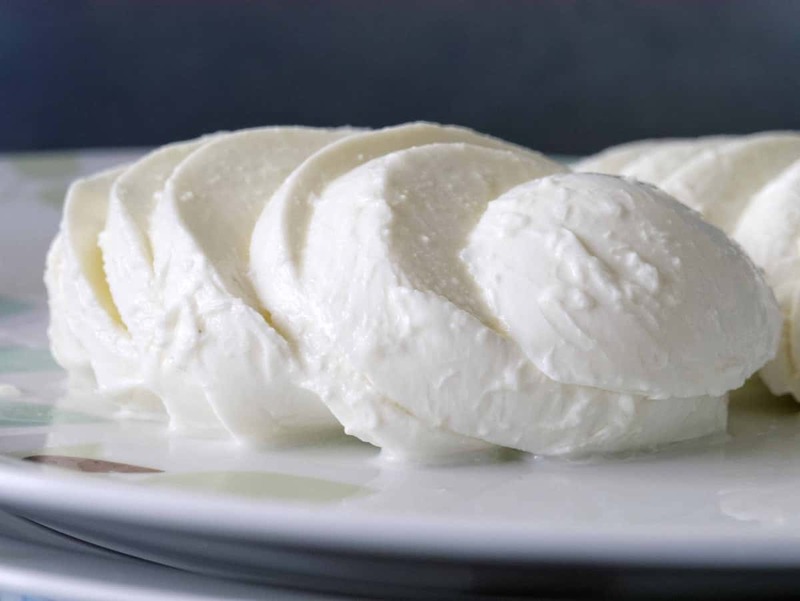 I have been wanting to try making mozzarella and cottage cheese. Great ideas. Great tips and totally eat in-season always! Plus love the quick mash! Yum! Thanks for the great tips! I need to do a better job of eating seasonally.